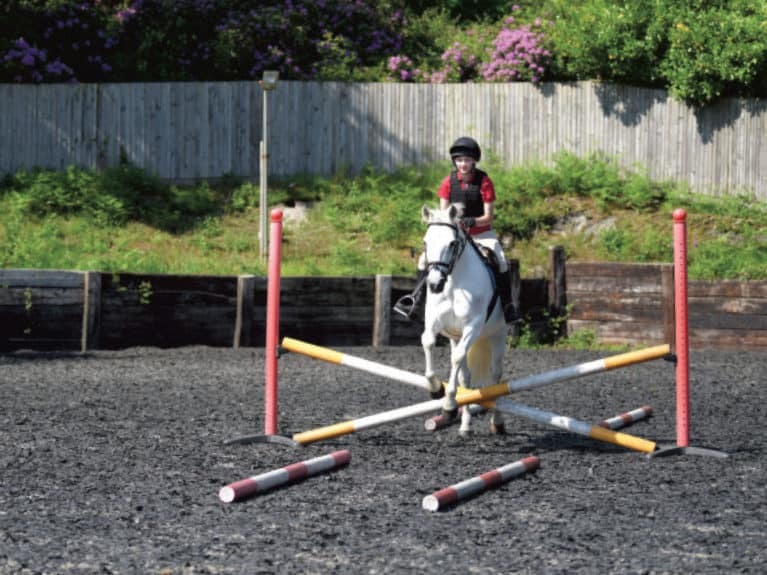 You can spend ages practising your jumping position and attempting bigger fences, but if you don’t spend time working on improving your line between them, you’ll find a course very tricky to clear. Getting a straight approach sets you and your pony up for the perfect jump, so getting to grips with it is really important. Plus it’ll help you jump clear every time! Every time you tackle something new, it’s important to make sure you’ve got a solid foundation. A good way to do this when you’re jumping is to begin with poles on the ground rather than tackling a course of fences straightaway. Did you know? Your line is the route you take to a fence. A straight one gives you plenty of time to set your pony up for the perfect take-off. Top tip – Make the channel narrower to improve your straightness even more. When you and your pony have got the hang of riding through the channel, add a pole after it, followed by another channel (so that you’re riding through an approach channel, then over a pole, and through a landing channel). Imagine the middle pole is a fence, and use the channels to help you get a straight approach and getaway. Make sure you have even contact on your reins, are putting both your legs on evenly, and are looking up and ahead. Ride over the pole and stay straight through the landing channel. Be aware that your pony might jump the pole the first time. 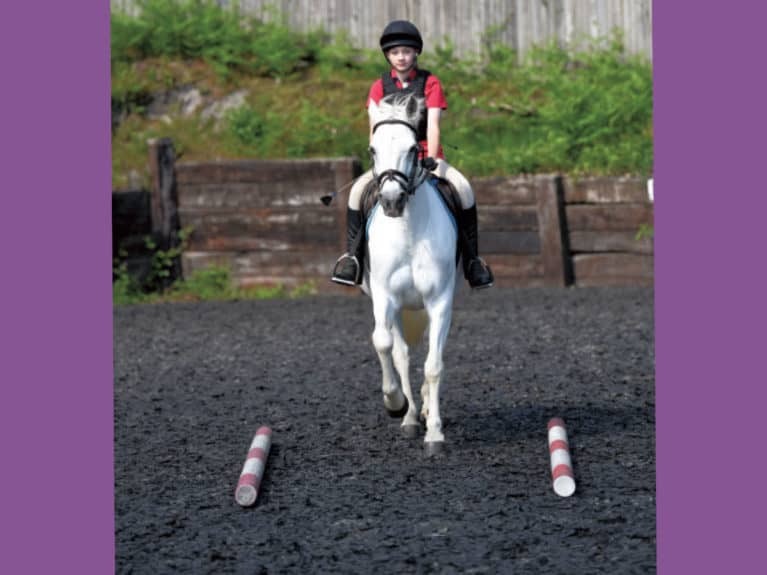 Top tip – Set out a few poles with approach and landing channels to practise riding a course without the pressure of having to jump. Top tip – Ride through the channel in walk first, then progress to trot and canter as you both get more confident with the exercise. When you’re feeling confident that you’re riding a straight approach and landing, build the middle pole up to a small cross. Use the same aids you’ve been practising to keep your pony straight. The only difference is you’ve got a fence to get over this time, too. Remember, it’s not all over once you land – keep riding straight as if you were riding a course and prepare for your next fence. Did you know? Cross-poles are great for helping you with straightness because it’s so easy to see where the centre of the fence is. Getting everything right for a single fence is one thing, but the real test is being able to nail the perfect approach when you’re riding a course! Set out a course of fences with approach and landing poles to help guide you round. Take it steady – it’s not a race – and you’ll find you’re much more accurate if you don’t rush. Top tip – Don’t forget to keep straight after the jump! When you’re riding a faultless course with help from the guide channels, it’s time to take the stabilisers away – try removing them one at a time. Take extra care to think about your line, and give yourself lots of space and time to get it right. Aim to ride three dead straight canter strides on each side of the jump and don’t forget to look ahead and keep your legs on! Did you know? You don’t need to work through all these exercises in one session. In fact, it’s better to spread them out over a few so that you and your pony have time to get the hang of it.